Phonographic Copyright (p) – Mariko Music Publishing Ltd. 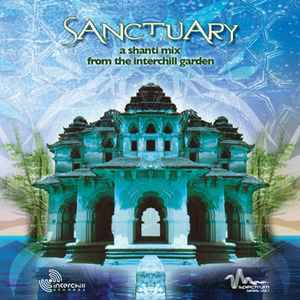 Copyright (c) – Mariko Music Publishing Ltd.
Subtitle: "A shanti mix from the Interchill garden"
(C) & (P) 2005 Mariko Music Publishing Ltd.
Interchill Records based in Canada comes here with another chill out compilation, this time trying out a new concept. This is a mixed CD with totally relaxed ambient, which is supposed to be suitable for yoga and meditation. When you hear about this concept, you might think it’s just another boring new age kind of easy listening thing, but when you see the track list, you will see that this compilation goes a bit deeper than the usual yoga CD you will find in your local incense shop... It is compiled and mixed by Naasko. This compilation has a very nice list of artists involved, and several of them are among my favourite artists. Such as Adham Shaikh, who kicks off the compilation with a beautiful, floating ambient track. Deep and meditating for sure. Track 2 is by Suns Of Arqa who has been releasing music for many, many years within tribal chill and world music, always bringing many musicians into their music. The downside of this group is that they release too much music in my opinion, instead of picking out the best ones... Anyway, here we get one of their most beautiful organic ambient tracks, with flute, running water etc. Nice one. Mere Mortals delivers track 3. A name you should be familiar with if you have followed the Interchill label. Here we get Indian vibes with sitar etc. Totally relaxed, even though here we get a few relaxed beats too. Ishq is another one of my absolute favourite ambient artists out there. The track he deliveres here is one of my favourite tracks on this compilation. Totally deep and melancholic ambient. Shakatura is one of a few ambient artists in the US who has made some really beautiful tracks through the years. The track we get here is one of his best tracks in my opinion. A track many of you will for sure recognise... Kaya Project releases a lot of music on Interchill, here we get a taste of their Walking Through album. We get more beats in this one for a change. A bit dubby, with organic vibes above. Beautiful as always from Seb. Gaudi is an artist who has been around for a while, but has become more known the last couple of years, with releases on Interchill and em:t. Rumours says he will make music with Pete Namlook too, which is a quality mark... Here we get one of the most chilled tracks on his album on Interchill. Chilled, eastern vibes. Mystical Sun gives us a track I can imagine would suit well for watching the night turn into day. Dreamy ambient music perfect for sunrise. Alucidnation is mostly known for releases on Big Chill. A track with some underwater, mystic vibes. I’m sure those who practise yoga might find this one perfect for it. The last track we get in this mix is made by Ekko, which is an ambient side project by Adham Shaikh. Deep and beautiful as always from Adham. As a dj, I prefer the compilations not to be mixed, but it is done in a really nice way. It can hardly become more laxed than this. Good tracks all the way, but most of these tracks are allready released on other Interchill albums and compilations, which is a downside for me. But, if you haven’t got these tracks elsewhere and you want a totally relaxed mix for you relaxation at home or for your meditation, this is probably something you should check out. With other words, this compilation is not a necessary buy if you allready are a collector of Interchill releases. But, a positive thing is that this one might hit another audience than the usual psychill customer.